StockCo allows you to fully fund your livestock purchases for restocking, trading stock, backgrounding and feedlotting. In most cases we provide funding for 100% of the purchase price and take direct security over the livestock only. 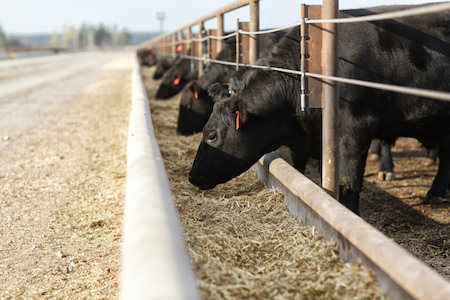 StockCo provides finance for backgrounding, finishing and trading livestock on pasture and in feedlots. We finance the purchase of stock by paying the invoice directly when you buy in store stock. You then carry the stock through to its maximum sale value and sell it. You’ll receive the sale value less the purchase price and finance cost. You can access additional cash flow by selling your unfinished stock to StockCo, receiving their current value now, in cash. You then continue to carry the stock to its maximum sale value and then sell it. You receive the sale value less the original cash flow payment and finance cost. We establish a trading limit, similar to a livestock trading or merchandise account limit. Within that limit you may purchase mobs of livestock. Each mob is funded as a lot. For each lot we agree with you a term for the trade. StockCo then settles the purchase invoice in full and carries the purchase price of the livestock plus accrued finance charges until the livestock are sold. When the livestock are sold, 100% of proceeds are sent to StockCo. StockCo then deducts the principal and accrued finance charges and remits the profit to you. You make all of the purchase and sale decisions. We understand there is a top and tail to all mobs of livestock, so it is fine to sell the top out early and extend for the tail if need be. We pay out the profit progressively as the livestock are sold, so you do not have to wait until StockCo’s debt on the lot is cleared in full before you receive any proceeds. What is StockCo’s Eligibility Criteria? Existing livestock producer (pastoral property or feedlot) with greater than 3 years experience. Own existing livestock producing property, but can also have other leasing or agistment arrangements. Are experienced in conducting the livestock trades proposed. What security does StockCo require? We take security directly over the livestock. We register our interest in the livestock on the Personal Property Security Register. We also track livestock movements via the National Livestock Identification System Database. Additionally, we require guarantees to be provided by the owners of major assets, if this is a different person or entity to the borrower. Will this affect my relationship with my bank? StockCo is not a bank. Our strategy is to enhance your relationship with your existing bank, by providing an opportunity for you to generate greater returns from your existing livestock business, without impacting your existing arrangements with your bank. We do this by taking direct security over the livestock we fund and by taking guarantees from major asset owning people or entities. In most cases we do not register a following mortgage and so this does not disrupt your existing security arrangements with your bank. We may reserve the right to take a mortgage if you default on your commitments with StockCo. Is there a minimum or maximum funding limit? We have a preferred minimum limit of $250,000, although we will consider applications for smaller amounts where there are reasonable prospects to grow over time. There is no maximum facility limit. StockCo has engaged in a number of transactions greater than $10 million. How do I apply and what information is required? You can apply by completing our online application form or download a form from our documents page. You can lodge your application with any of our approved distribution partners (provide link) or directly with StockCo. In most cases we will visit you on farm to ensure we have a thorough understanding of your business and your goals. Generally StockCo will provide a decision on applications within 2 business days of receipt of all necessary information. Once approved, how long before I can start trading? Once your application is approved we aim to have loan documents to you within 2 business days. You are able to commence trading as soon as we receive properly executed documents and have completed our security registration. Are there any special instructions for my agent or buyer? Will you advance funds against livestock I already own? Yes, we will advance funds against livestock you already own, so long as they are intend for sale within 12 months. In most cases your existing livestock will be captured by your bank’s security and we will require a release from any security holders before we can advance funds against existing livestock. What if I want to repay my StockCo facility before the livestock are sold? You can pay out your obligations to StockCo at any time with no penalties. Once the StockCo facility is finalised ownership of the livestock transfers to you.